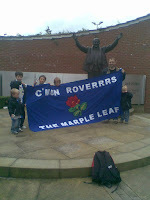 This blog's flag and the family had a very enjoyable day out at the Rovers yesterday. I love it that none of the so-called Big Four won yesterday. The way Arsenal played really betrayed the arrogant belief that they simply deserve to win. They can't comprehend another team beating them, or preventing them winning, by fair means. It has to be "violent Blackburn" or "goalkeeper error". Do me a favour? Every time an Arsenal player was tackled he goes down like he's been shot by a sniper from the roof the Jack Walker stand (was it you Jack?). Did we not gift them a soft goal too? Fouls were about even. We had more possession and more shots. Make no mistake, they can play some lovely football, but so can Rovers. David Dunn and Chris Samba were immense yesterday. Not for lumping or hoofing, but for their quick feet and some intelligent passing moves. It's been 7 years since Jack Walker died. I never thought we'd still be in such good shape without him, but we are. RIP.